Visualization tool details your cloud infrastructure. Is there a better alternative to Nephorider? Is Nephorider really the best app in Developer Tools category? Will Nephorider work good on macOS 10.13.4? Nephorider is a simple visualization tool that lays out clearly and simply the details of your cloud infrastructure. It's all here: server structure and attributes, security groups, costs. Adding documentation through drag and drop tagging allows you to specify more angles through which you would want to see the server system, by using the dedicated filter tool. Furthermore Nephorider allows to define your own set of exceptions, indicating potential structural problems and export PDF diagrams of a complete cloud system. 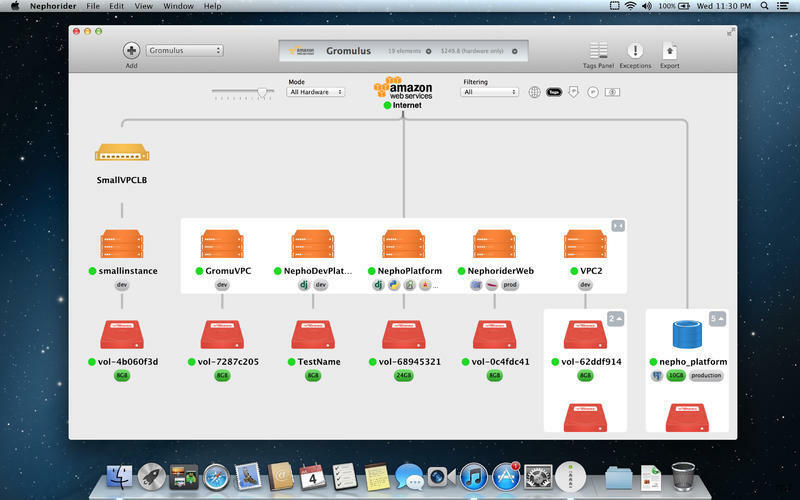 Nephorider supports Amazon AWS and Outscale. More instances choices in predicate options for exceptions. Nephorider needs a review. Be the first to review this app and get the discussion started! Nephorider needs a rating. Be the first to rate this app and get the discussion started!